Photo: Brazilian police block access to the scene of a confrontation between alleged traffickers and a special operations unit in the Santa Teresa neighborhood of Rio de Janeiro, Brazil, Friday, Feb. 9, 2019. Rio de Janeiro. 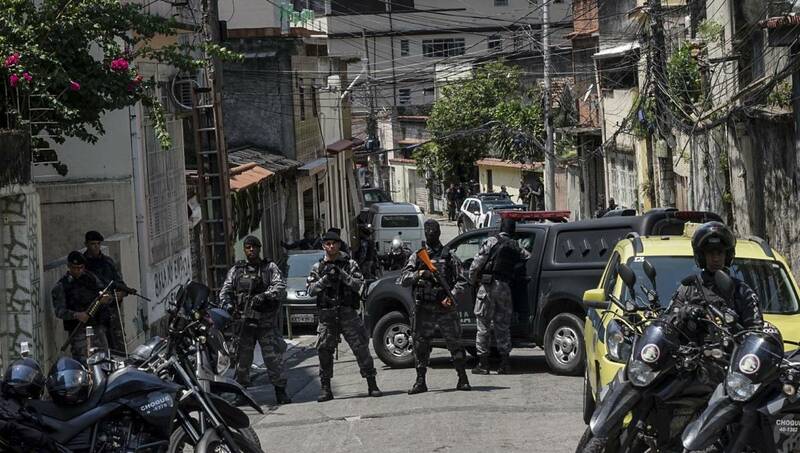 Feb 9 : Brazilian police shot dead at least 13 suspected drug traffickers on Friday during a shootout in a slum in Rio de Janeiro’s bohemian neighborhood of Santa Teresa. The confrontation broke out when officers were greeted by gunfire as they entered an area where the suspects were hiding, according to police spokesman Col. Mauro Fliess. He said that no police were hurt. Officers seized drugs, rifles, guns and ammunition during the anti-drug trafficking operation. Police said later Friday that the death toll had increased to 13 after two wounded suspects died in the hospital. Rio de Janeiro is one of the world’s most violent cities with frequent shootouts between police and drug gangs and an annual homicide rate of around 50 per 100,000 inhabitants. Photos taken by The Associated Press showed a desperate woman running down a narrow street and the photographer said she was yelling that the police were getting ready to “execute” people inside a nearby house. At one point a shot was heard ringing out from a house and moments later two heavily armed officers were seen on a pickup truck carrying two bodies shrouded in blood-soaked sheets. Brazil’s new far-right President Jair Bolsonaro campaigned with promises to crackdown on rising crime and said that police who kill criminals should be given medals not face prosecution. In December, Human Rights Watch said in a report that police killings were at a “record high” in Rio. “While Rio police sometimes kill people in legitimate self-defense, research from Human Rights Watch and other groups shows that many killings are, in reality, extrajudicial executions,” the report said.